An easy dinner or appetizer idea! 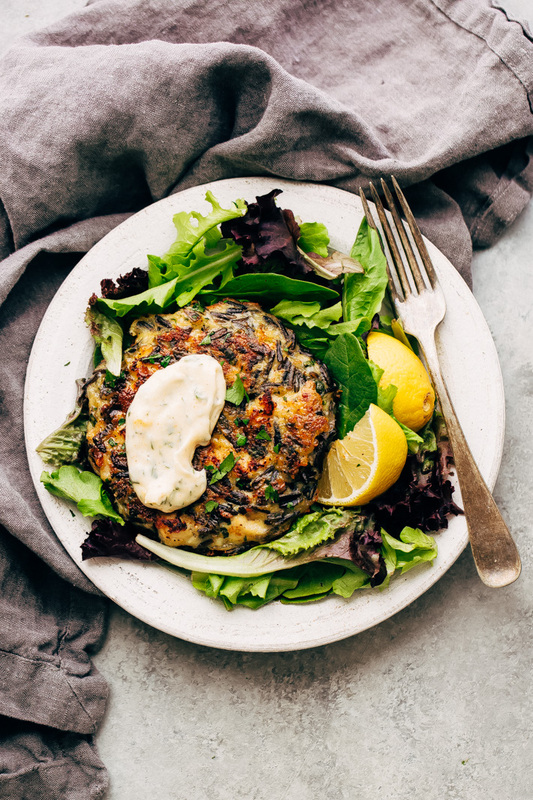 These cheesy wild rice chicken fritters are perfect to serve between burger buns, on a salad, or as appetizers for your next get together! 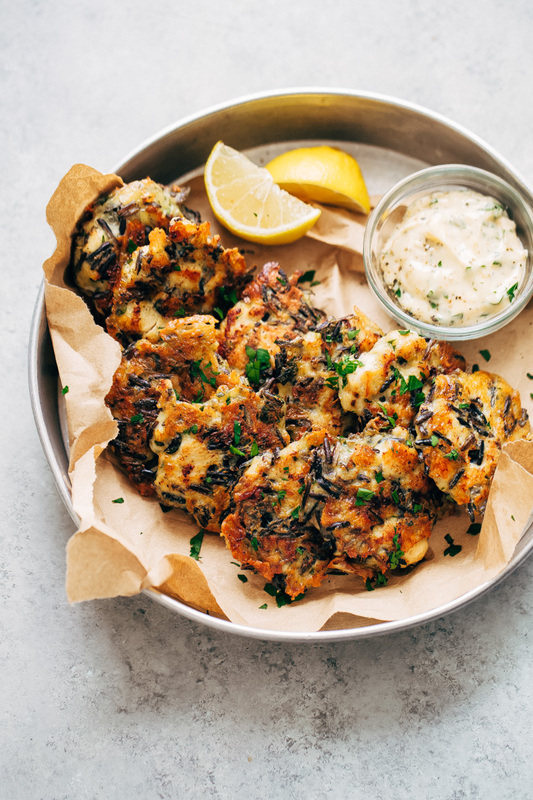 Wild rice + chicken fritters! Yes, you read that right, friends. It starts with cheese (as most of the best things in life often do) and then comes the nutty and chewy wild rice and the tender chunks of chicken all bound together with mayo, flour, and eggs. Basically, what you’re left with is the perfect two-bite fritters that are great to put out during the holiday parties for apps. Especially when it comes with garlic herb dipping sauce. And really, who doesn’t LOVE a good fritter?! 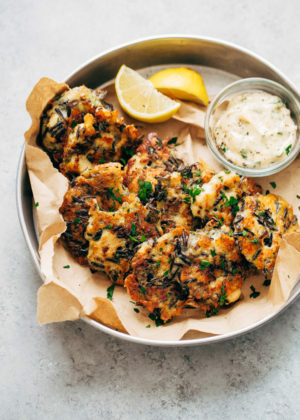 These cheesy wild rice and chicken fritters are a game-changer. They’re perfect to serve to guests before a big holiday dinner: enter Thanksgiving, Christmas or for a pass-the-apps New Year’s Eve party. 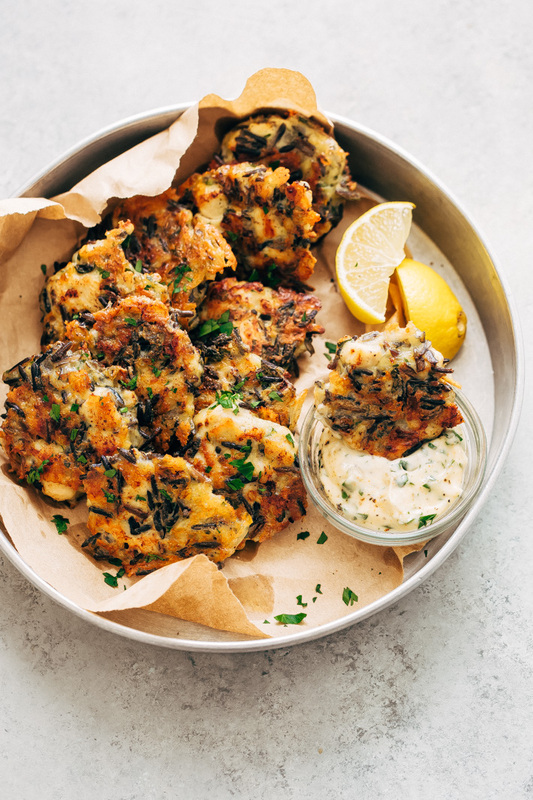 Also, they look fancy schmancy but no one needs to know that you can make the fritter mixture 24 hours in advance, pan fry the fritters hours before the event and then hold them in a hot oven and serve them up nice and warm when you’re guests arrive. And wouldja look at that? This cheesy chicken fritters recipe is super simple. It starts with the wild rice. 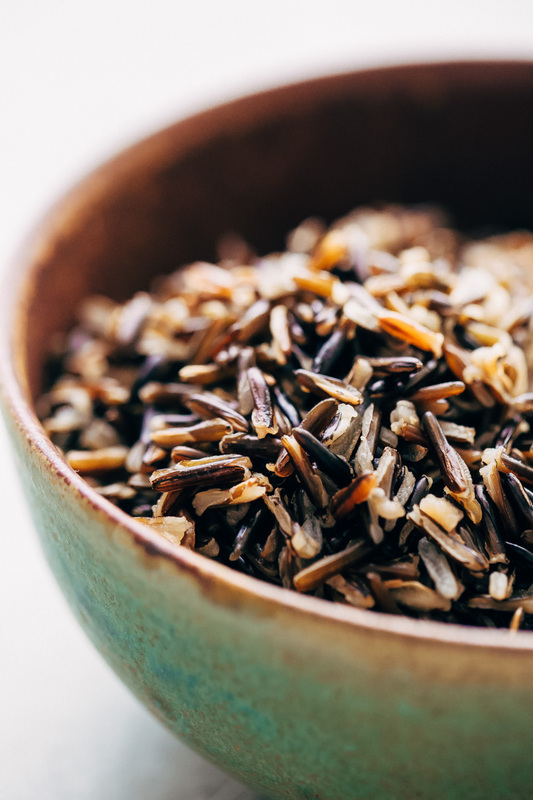 Not white rice, or brown rice, or wild rice blend – we’re talking straight up wild rice. Here’s  (affiliate link) where you can buy them if you can’t find them in store. 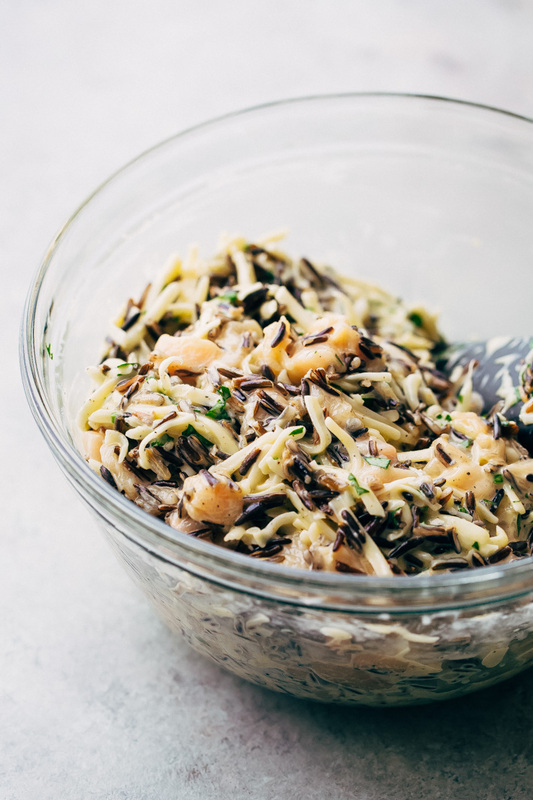 You’ll need about a 1/2 cup of uncooked rice to yield the 1 1/2 cups of cooked wild rice you need for this recipe. Wild rice takes a lot more time to prepare than regular white rice, think almost three times longer. So make sure to plan for that. You can even prep the rice a couple of days in advance. Once the rice cooks, it’s as simple as stirring a few ingredients together. You’ll need a little mayonnaise, a little flour or cornstarch, and three eggs. I’ve only tested this recipe with anything other than mayonnaise so, at this time I’m not sure if there are any other substitutes. I want to add that mayonnaise plays a two-part role in the recipe: 1.) it acts as a tenderizer for the chicken and 2.) it’s a binder. The flour, eggs, and mayo hang out together creating the perfect adhesive for the cheese, wild rice, and chicken. 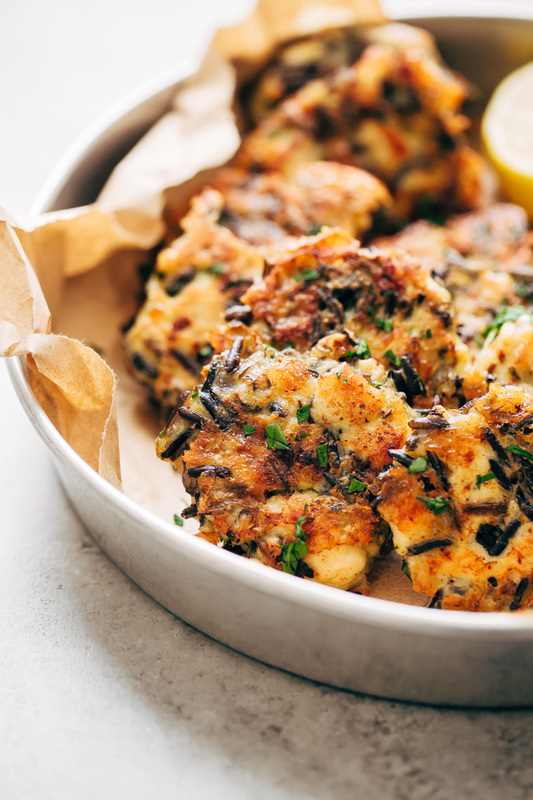 I’m telling you, wild rice chicken fritters make the best appetizers or even the ideal meal. While we’re on the topic of cheese, I want to mention; I used shredded swiss and gruyere cheese. I found pre-shredded swiss and gruyere mix at Trader Joe’s. Is this a new product? I’ve never seen it before. But really, whatever melting cheese you like would work for this recipe: pepper jack, smoked gruyere, mozzarella, cheddar. Just about anything that melts well will do the trick! When you’ve mixed up your chicken fritter mix, just cover it and pop it in the refrigerator. It’s going to look thin, but once you let it sit for several hours, it’s easy to scoop and fry up the fritters. I like to make the fritter mixture the day before and just let it set up nicely overnight. One thing I’d like to point out, you want about a tablespoon of the mix for each fritter. I like to use a cookie scoop  (affiliate link) in one hand and a teaspoon in the other to help flatten the batter out in the frying pan. Make sure you only fry up a handful of these at a time. Overcrowding the frying pan makes it challenging to turn the chicken fritters. You can make larger patties with a heaping 1/4 cup of mix each and top your salads with them or if you don’t mind some carb-on-carb action, pop them in between a burger bun. So prep the mixture on Sunday and you can pan-fry these patties right before dinner time on Monday and have a perfect bagged lunch on Tuesday. 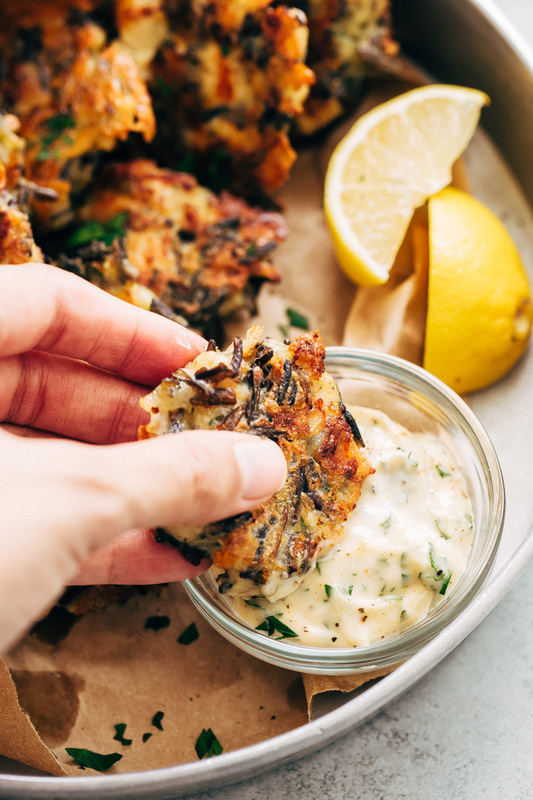 The garlic herb sauce is quick to make and goes perfectly with wild rice chicken fritters. It’s just a little mayo, lemon juice, cayenne, chopped parsley, and garlic powder. Mix it up in a bowl, and you’ve got the most straightforward, yet tasty, dipping sauce right at your fingertips! It’s great as a salad dressing or as a spread for burgers as well. 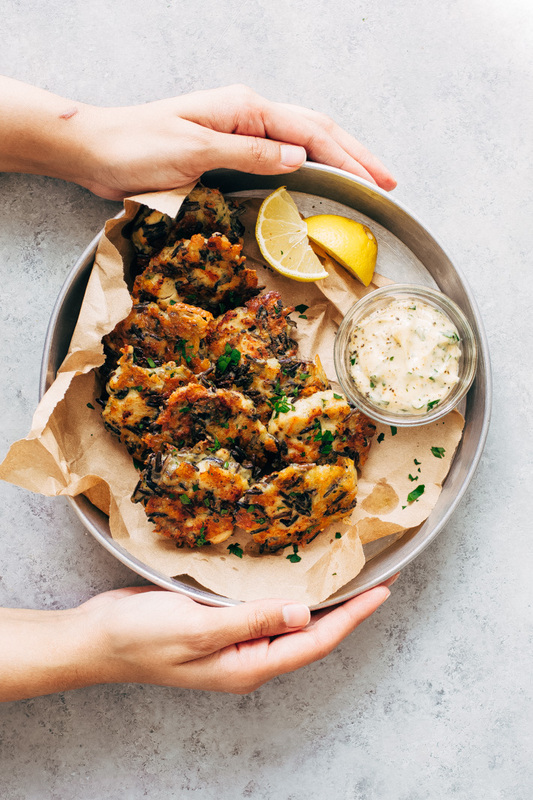 Cheesy chicken wild rice fritters are going to make the perfect bagged lunches, weeknight dinners, and holiday appetizers! I say yes to all three. These were a huge hit at our place! Fritter mix: Whisk together the mayo, flour, eggs, cayenne, garlic, salt, and pepper in medium bowl. Add the shredded cheese, cooked wild rice, diced chicken, parsley, and use a spatula to mix. The batter will seem a little thin. Cover and refrigerate for at least 2 hours and ideally overnight. Pan-Fry: Add a tablespoon of oil to a ten-inch skillet over medium heat. Using a small cookie scoop  (affiliate link) in one hand and a teaspoon in the other, drop the fritter batter into the skillet with the scoop and use the spoon to spread out the mixture into a small, 1 1/2 inch circle. Allow the fritters to cook for 6-8 minutes, flipping halfway through until the fritters are golden on the outside and cooked all the way through. Repeat with the remaining fritter mixture, adding oil to the pan as needed. While the fritters are frying, prepare the sauce. Sauce: Combine the ingredients for the sauce in a small bowl. Adjust with salt and pepper to taste. 1/2 cup of uncooked wild rice  (affiliate link) yields 1 1/2 cups of cooked rice. I haven’t tried swapping the mayo for things like yogurt or sour cream so I’m not sure how that would go. If you decide to try it, do share your results with us, please! For a gluten-free option, swap out the AP flour for cornstarch. I used a shredded swiss and gruyere mix for this recipe but just about any cheese that melts will work well. Mozzarella is a perfect, economical option!